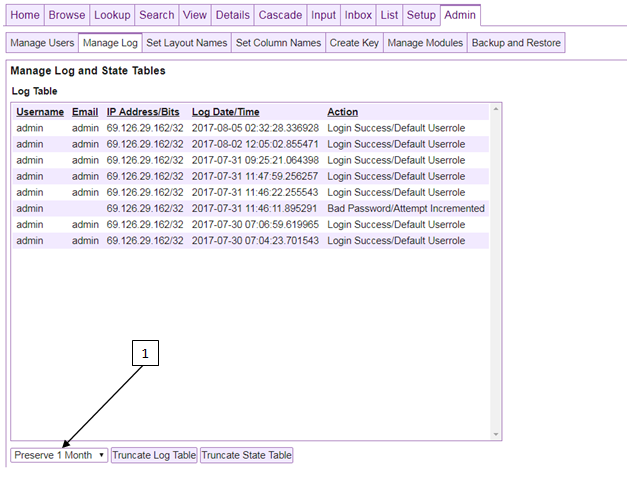 The Manage Log module is for managing the log of the database. Here you view log entries of important events including who is logging into the database and if there are any failed login attempts. The Manage Log module is only available to administrators and can be selected from the Manage log button on the left of the Admin tab. The button and dropdown allow the administrator to truncate the log saving the time period selected in the dropdown. The log will grow endlessly if not truncated periodically.